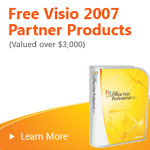 The kind folks over in Redmond have informed the Visio Guy of some deals regarding add-on products from Visio partners. If you are an IT guy or do business process management, then you should probably check these offers out! There are seven free IT and BPM products on offer. While no purchase is required, you do have to do a tiny bit of work to get at them, as you might expect. 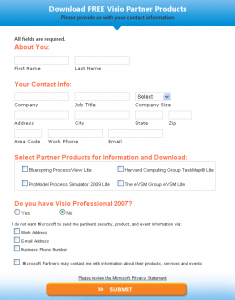 When you click on one of the free-product links below, you’ll be taken to a landing page on Visio Toolbox, which corresponds to the product of interest. A fat, juicy, orange button will beckon you to REGISTER TO DOWNLOAD NOW. It’s one of the prettiest registration forms I’ve seen in awhile, and it is reasonably short. 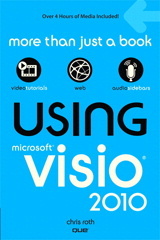 They all work with Visio, and judging by the descriptions, they all do some pretty amazing stuff. So even if you don’t choose to register for the free stuff, check out the product descriptions and browse to the company web-sites. The offers are valid in the US, and expire on December 31st, 2009, but might be extended. If you’re an IT or Business Process type, I’m sure you’ll find some of these products interesting! Bluespring ProcessView Lite (value of $199): ProcessView helps business professionals quickly and accurately analyze, improve and report on processes modeled in Visio. ProcessView seamlessly integrates Visio with Excel and PowerPoint to create a one-of-a-kind ‘Business Process Analysis’ solution that will help drive measureable improvements in your processes. Codima autoMonitor (value of $2000): Download a One Stop Solution for Enterprise Level Network Monitoring (value $2,000). Automatically map, monitor and troubleshoot IT networks with visualization directly in Visio®. Gain visibility into performance related issues with a few clicks and simplify network monitoring. Harvard Computing Group TaskMap Lite (value of $250): Document and publish processes in minutes! TaskMap® Lite offers the simplest, fastest way to document work procedures. For FREE! By the way, Scott Helmers is a partner at Harvard Computing and a Microsoft Visio MVP. You can see an interview with him here. 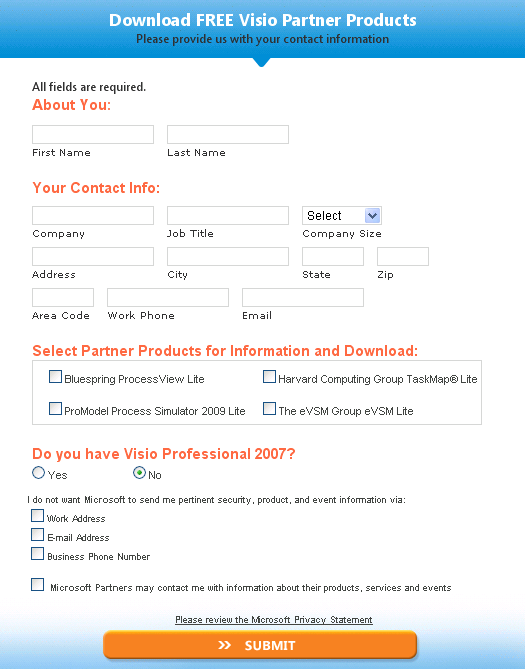 ProModel Process Simulator 2009 Lite (value of $599): Process Simulator 2009 Lite utilizes the powerful capability of Data Graphics and External Data linking in Microsoft Office Visio 2007 Professional. When linked to simulated scenario results, Data Graphics provide a more visually interactive means to process analysis and optimization. Healthcare organizations take advantage of the specific healthcare stencil graphics to more accurately and rapidly develop their charts and models. RACKWISE Data Center Manager OnDemand (value of $1000): RACKWISE Data Center Manager (DCM) OnDemand is an Enterprise Class – Data Center Management solution, delivered in a Software as a Service (SaaS) mode. RACKWISE OnDemand, is a software service designed for data centers with less than 100 racks. SolarWinds LANsurveyor Express (value of $499): Create network diagrams in a snap! Get this network discovery and mapping Visio plug-in free (MSRP – $499) through this exclusive offer with Microsoft. Register to get your license key & begin mapping your network today. The EVSM Group eVSM Lite (value of $99): The eVSM Group software add-on to Visio is a simple “drag & drop” value stream mapping, analysis and management capability widely used in manufacturing, services and healthcare. See the eVSM Group client list at www.evsm.com/clients. Not the first time I read that. Does anyone know the reason ? Or may I suppose that … ? Anyway, the result is that … . That would be a good reason. Giving things for free like IE, has been an act of monopoly according to the bureaucrats. I have allready thrown my flames to the European Union in previous messages. How did you get the key for the Solar Winds product? I tried downloading with 2 different e-mails and have seen nothing come thru about it. I haven’t tried the products myself, maybe someone else can share their experience with the Solar Winds trial? It includes a tutorial. You can add the Visio UML 2.2 stuff from http://www.softwarestencils.com into the BPMN sub-directory it creates so you can use both. Tried to get the Solarwind tool but got a server page error about last name not being included. Went to the Solarwinds site and the free offer is not listed there.